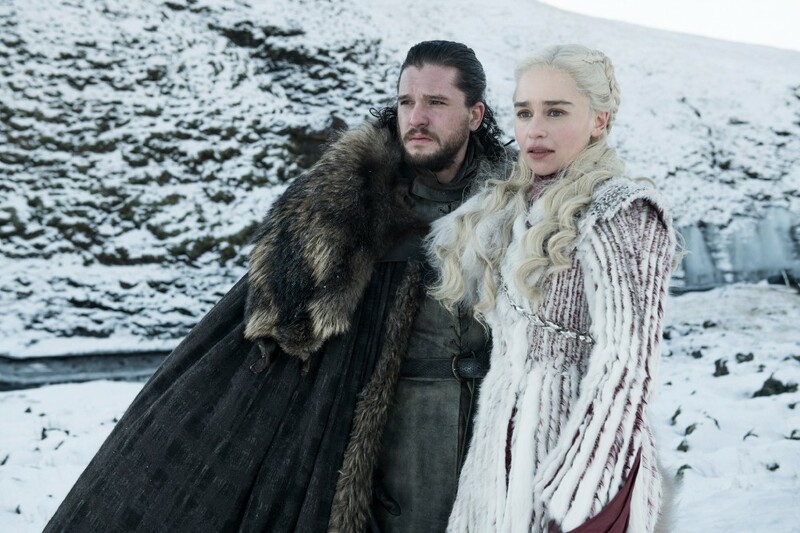 With the coming of the final season of HBO’s Game of Thrones, the mainstreaming of the medieval-fantasy genre that began with Peter Jackson’s Lord of the Rings movies is complete. That’s not to say that we won’t have more fantasy on our screens—Amazon will be airing a Lord of the Rings prequel series, and the Harry Potter franchise is continuing through the Mythical Beasts movies. But the behemoths of Westeros, Middle-Earth, and Hogwarts have crushed the beloved talismans of my teenage years beneath their sandaled heels. The tattered paperbacks by Fritz Leiber, Michael Moorcock, Roger Zelazny, Jack Vance, Robert E. Howard, and the rest of the Gygax-approved reading list; the Boris-Vallejo-decorated VHS tapes of sword-and-sorcery-and-hairspray films such as Deathstalker, Barbarian Queen, Beastmaster, Barbarian Queen II, Beastmaster II, Deathstalker II, Deathstalker III, etc.—all lie like Ozymandias’ shattered statue in Shelly’s poem. In their imagined past, Romantics both located a world they felt contained the virtues modernity had lost. They also justified the creation of national communities by rooting them in the imagined past: Walter Scott’s Ivanhoe, Victor Hugo’s Hunchback of Notre Dame, and the Grimm Brothers’ fairy tales were all situated in the long-ago and far away. Here’s Romanticism for you in a single image: J.M.W. Turner’s The Fighting Temeraire. With dribs and drabs of paint on canvas (really, your screen can’t convey how textured Turner’s paintings are), he conveys the ugly, smoke-belching modern (for 1838) steam tug dragging the great sail-powered warship, gloriously captured from the French during the Napoleonic wars, off to be broken up for scrap. As a medieval historian, Tolkien perhaps felt he could not situate his tales in a past he knew too well. Like his contemporaries, he seemed to think that modern rationality made the traditional settings – the Middle Ages of our world or the faerie-world of Celtic mythology – insufficient. He therefore “sub-created” a world for himself – Middle-Earth – that would allow his imagination freer rein. Tolkien was not the first to imagine a new world; his antecedents arguably go back to Scholastic philosophers positing a multiplicity of universes, not to mention his predecessors William Morris and George Macdonald—particularly Morris’ Wood Beyond the World and The Well at the World’s End and Macdonald’s Phantastes and The Princess and the Goblin. But Tolkien built on Macdonald’s ideas by emphasizing the quasi-divine role of the writer: “…in such ‘fantasy,’ as it is called, new form is made; Faerie begins; Man becomes a sub-creator. He makes a Secondary World which your mind can enter. Inside it, what he relates is “true”: it accords with the laws of that world. You therefore believe it, while you are, as it were, inside.” So fantasy, in other words, is a Middle-Ages-that-is-not-the-Middle Ages. Similarly, Westeros is based on elements of fifteenth-century England, but George R.R. Martin is also able to incorporate elements of the Age of Exploration, ancient Rome, and the Viking Age as it suits him. Many critics (notably, Moorcock) have pointed to Tolkien’s crypto-fascist tendencies, with his divinely-appointed leaders, traditional gender roles, Orientalized Haradrim, and proletarian orcish üntermenchen working in the forges of Mordor and Isengard. Romanticism also has its troubling aspects: As many modern commentators have pointed out, the creation of national communities opened the door to exclusion, racism, and genocide. The Third Reich’s obsession with volkskultur, “Aryan” history, and cultural purity on the one hand, and the extermination of Europe’s Jews on the other, is perhaps the most prominent example. Another is how the New Zealand shooter Brenton Tarrant festooned his equipment and social media with references to both recent and medieval history. However, I want to point out that Romanticism, and fantasy, are not necessarily retrogressive: William Morris, in particular, was a socialist, a strong believer in the dignity of workers, and an anti-imperialist. Fantasy can therefore be allied with either progressive or reactionary political ideas. Moorcock and Morris are notable examples of the former, as are Ursula K. Le Guin, Samuel R. Delany, China Miéville, N.K. Jemisin, and Marlon James. I would arguably include Martin in this number; not only has he struck back at the Sad Puppies’ attempt to hijack the Hugos, but Martin’s heroes are the marginalized: the physically disabled or mutilated, abused women, and slaves. In this making of sub-creation into a place for political theater, contemporary fantasists are truly continuing the Romantic tradition. But of course, sometimes we just need an escape from the complexities and darkness of the world. Much as the arch-rationalist, politically progressive J.S. Mill found refuge in romantic poetry, we occasionally need to turn our brains off. That’s why no matter how glitzy, high-budget, or socially acceptable fantasy gets, there’ll always be a special place in my heart for Willow, Krull, Ladyhawke, The Neverending Story, Conan the Barbarian, and, of course, The Princess Bride.